Welcome to our March Stamp of the Month Blog Hop! 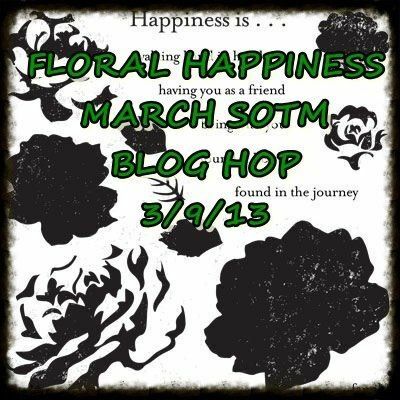 This month's stamp from Close to My Heart is "Floral Happiness" and is available exclusively through your Close to My Heart consultant from March 1 - 31, 2013. You can purchase this stamp set for only $5 with a qualifying purchase. If you have just hopped onto my blog, please start at the beginning at Lucy's blog – Love 2 Create If you came from "Priscilla " of " Priscilla's Paperie then you are in the right place! For my base I used a 4 1/4 x 5 1/2 white card base. To that I cut a 4 x 5 1/4 piece of buttercup card stock, a 3 3/4 x 5 piece of twilight, and a 3 1/2 x 4 3/4 patterned paper from the Chantilly paper pack. I then stamped 4 of the small roses in cotton candy ink, and out lined the center of the flowers with a cotton candy marker from Close To My heart. The markers come as a duo, and I used the darker pen of the 2. I stamped the smaller leaves in Pear, and then the stems in Topiary. I added a wee bit of silver glitter glitz to the center of the roses. The bow is seam binding ribbon. 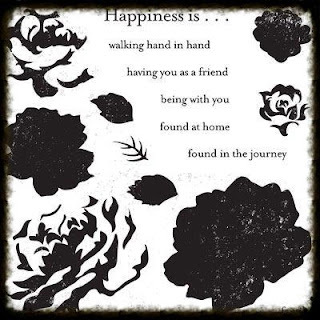 The sentiment is heat embossed using midnight black opaque embossing powder (from my stash), and the sentiment is from Scrapbook statements-Poets. All supplies Close To My Heart unless otherwise noted. I love your card. I love that you give measurements so others can recreate! Thank you! What a clean & simple design, great use of colors. I love the Chantilly paper, it has beautiful colors. So lovely...very creative and love the clean look on the flowers! You've been nominated for a Liebster Award! Check here for more info! Gorgeous card! I really like the combo of colors! Oh my word! LOVE LOVE LOVE THIS STAMP SET!! !